They've opened an ice-skating rink by the Royal Pavilion, with a 'pop-up' version of one of the posh Brighton restaurants in the marquee beside it, which is clearly all very picturesque and appealing, but boy is it pricey to get in. Fortunately, I was pre-warned (via Twitter, which basically tells me how to get dressed in the morning these days), and we turned up having decided to give Item a pre-Christmas treat. We'd also decided ahead of time that just The Boy should accompany her, because otherwise it was going to be nigh on £30 (with just one adult it was £18.50). I was rather afraid she would get fed up so soon that it was going to work out at £6 per minute. 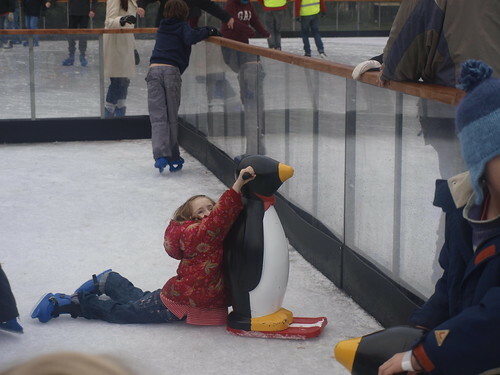 But, against the odds (and thanks in large part to those penguin zimmer-frames), she insisted on getting the entire hour's worth of falls onto her knees and bottom. See? Actual joy. Now that's what we pay the big bucks for, the photo-opportunity. 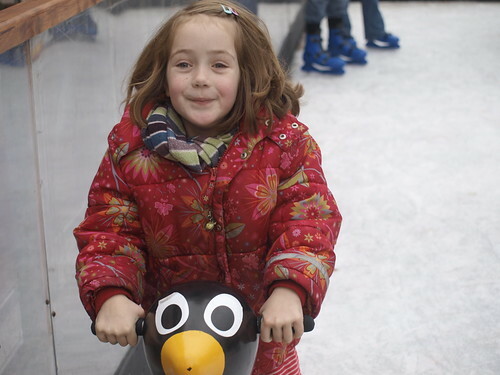 The other thing that helped a lot was bumping into (quite literally) her classmate Ruby, whose parents very kindly picked Item up a good few times when the Boy - not supremely confident himself - got caught up in a one-way stream of people going round the edge of the rink. 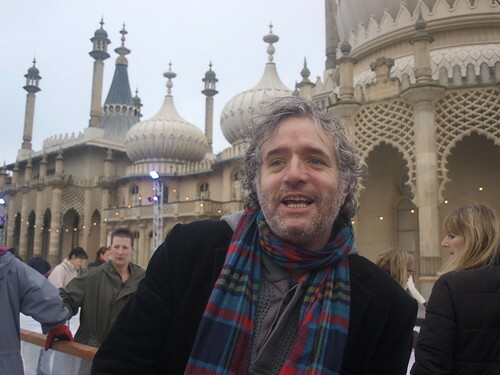 I couldn't help thinking that if anyone from Canada had been watching the people of Brighton paying top dollar to edge timidly round the rink, holding onto the sides, they'd have been killing themselves laughing. We are not a population well-used to this particular sport (our city's ice rink closed down several years ago; there are controversial plans afoot to build a new one).